Good afternoon, You may or may not be aware, but the government are proposing that the age for which vehicles of historic interest become exempt from MOT will now be pre 1978 (40 years old) from the 20th May 2018. This proposal is not the whole story however. Vehicles pre 1978 which have been ‘modified’ may now no longer be MOT exempt and may actually require to be inspected to a much higher level as would a new car and lose their period registration number, being allocated a ‘Q’ plate. I have been dealing with this on behalf of our club, contacting various organisations within government and interested bodies as this has a potentially devastating impact on the classic car environment, with the potential to turn many classics into valueless commodities or be left to rot in garages as it will cost too much to bring these vehicles into line with the new regulations. Basically, having spent many hours reading all the links below, I have put forward an argument that the governments proposed legislation for ‘modified classics’ is not fit for purpose. As a starting point there is an on line petition https://petition.parliament.uk/petitions/201721 which is to try and stop the historic registration numbers being removed. Here are links to the proposals and the new legislation which I have based my arguments on. Chris Grayling MP, Secretary for State for Transport chris.grayling.mp@parliament.uk. Humza Yousaf MSP Minister for Transport & the Islands Humza.Yousaf.msp@parliament.scot. I had also contacted the SVVF whom I feel, as the member body for Scotland should be doing this, found out that a) they hadn’t done anything up to last weekend, at least not contacting member clubs about it and b) Following me raising issue, they raised it as an agenda item for last Sunday’s meeting. I currently await their reply. I have signed and shared the petition on Facebook. I didn't realize how far reaching this proposal is. Although defining "original" could be tricky. If your car scores 8 or more you get to keep your reg #. I say fair enough (I think)! The most worrying part is the (very) modest 15% increase in power limit (if carried out after 1988). Based on what/how are they going to police that? With modern fuel/oil/electronics I am betting 50 to 70% of Historic Vehicles will not comply, probably more? Another problem may be that it will wipe out the market for a lot of aftermarket add on's and will likely hurt said suppliers. To be honest I am ambivalent to MOT exemption but do find the free road tax attractive, at the moment I only tax a car if I am going to use it then claim it back when done, of the five classics I run this can involve taxing then reclaiming up to 9 times a year! Free tax would be sooo much easier and probably not cost the exchequer very much. Hi Steve, I have tried to complete your petition several times but am prevented from sending it due to not clicking on the "email address ".Your help would be appreciated. I am fully behind the comments put forward. The links you posted to many of the documents have been foreshortened, making them useless. Can you re post them as text? REX wrote: Hi Steve, I have tried to complete your petition several times but am prevented from sending it due to not clicking on the "email address ".Your help would be appreciated. I am fully behind the comments put forward. I tried and sent it OK but did not get the email response to verify? I will see what I can do when I get home. This was a guy at a local car club doing this. Anyone any thoughts on the interpretation by DVLA on the rules regarding a TR7 with V8 conversion? My car has a Rimmers supplied front crossmember. Under the points system I would think it might loose 2 points on axles as this part is non original to my particular car. 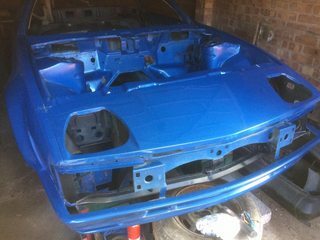 However it's not modified and is an original Triumph part as fitted to other convertible body shells. As I will loose another 1 point for the engine I should still qualify to keep the reg number. Under the 40 year exempt tax/mot rule I think it may loose out and still have to tax and mot the car every year. Another question I have been asking myself regards the policing of the new rules. As the UK gov have found fit to close all the local DVLA offices and reduce the numbers of employees in other departments such as VOSA (now known as DSA) I wonder who is going to inspect and make a ruling on individual cars? The points system seems to have fallen by the way side already. Just go to any Hotrod show and look at some of the cars which retain tax exemption and original reg status! Coming from a rather rural area cities 50,000 or under, we have no emissions checks, safety checks on vehicles coming in from outside the country and rare safety spot checks on the side of the road (I've never personally seen one except a few for commercial trucks) it sounds like a case of "OK, we've cleared off our desks, what do we do now so nobody gets laid off?" Looking at the latest news on this silly proposal it seems that cars modified in the past 30 years will not be eligible to be declared as being a vehicle of historic interest or VHI so they will not be eligible to be exempted from the MOT. However modifications to improve safety or environmental performance may be allowed. This could include things like improved braking or electronic ignition so that poses another load of questions. So I can just continue to get my car MOT'd every year and carry on as normal. I quote from the old TV comedy "Oh dear, what a pity, never mind". Just read an article in Classic Car Weekly (3/1/2018). It states the governments position on tax/mot exemption for modified cars over 40 years old has been clarified. Clarification has been given on the term 'Substantially changed'. Vehicles will be classed as being 'substantially changed' if alterations have been made to the chassis/monocoque, axles and engine modifications. Alteration of the type and or method of suspension or steering will constitute as a substantial change. Alternative cubic capacities of the same basic engine and alternative equipment engines are not considered substantially changed. 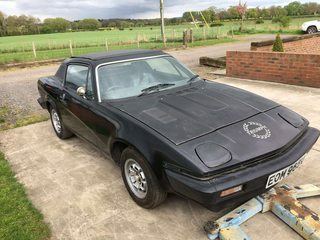 Anyone like to comment as to whether a TR7 V8 falls into the substantially changed category or not? 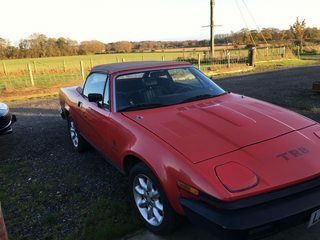 Did Triumph ever badge/sell a car called a TR7 V8. 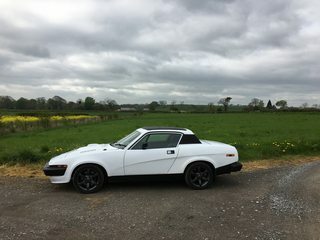 If so maybe a 40 year old TR7 with a V8 conversion will benefit from tax exempt status? Would like your views on this please. Still seems pretty confused, and it seems to be up to the owner to make the judgement if it is substantially changed'. Engine – alternative cubic capacities of the same basic engine and alternative original equipment engines are not considered a substantial change - ie changing to sprint engines is OK? If the number of cylinders in an engine is different from the original, it is likely to be, but not necessarily, the case that the current engine is not alternative equipment. The V8 was alternative original equipment in a way so is that OK? Axles - '...in respect of axles and running gear changes made to improve efficiency, safety or environmental performance'; so fitting larger/better brakes is OK? Changing the 4 speed to 5 speed axle is OK? There are a number of subjective things like these. Irrespective, and my car is not exempt for another 3 years, I think I would still want an MOT just to get a better inspection than I can manage. Saabfast, thanks for your comments. Like yourself the mot side of this is of little concern to me as I will get my car tested annually regardless of the new rules. It's the 'historic' tax classification I am more interested in. As you say it will be up to owners to make a judgement as to whether their car is "substantially changed' and the government wording is woolly enough to be open to interpretation. Are these two things directly linked, i.e. if it's not MOT exempt it isn't tax exempt either?